Permanently mounted, this compressor is installed into your truck and includes a full wiring loom with air locker solenoid plug in contacts, mounting hardware with reinforcing bracket and quality compressor isolating switch. 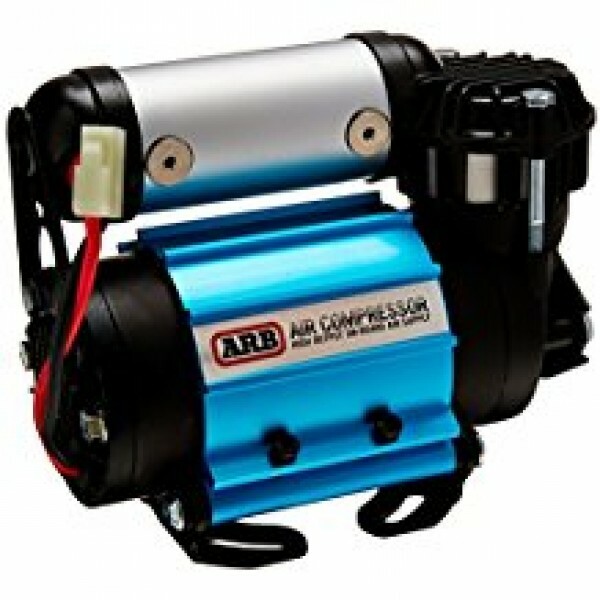 This compressor, with the addition of ARB Pump-Up Kit (part #171302) can be used to activate air lockers, and can perform other functions such as inflating camping gear. So what makes this compressor special? It's small enough to fit into even the tightest space and quiet enough to mount in the cab. It has enough output to air up four 35" - 37" tires in a single duty cycle and typically airs up a 35" tire in just over two minutes. And, it works. We've tested this unit in ovens, freezers, underwater and in the silty dust of the Simpson Desert and it continues to perform.